African side Ghana became the first side to secure a place in the quarter-final with a hard-fought 3-1 victory over Finland at the Estadio Charrúa in Montevideo, Uruguay. Though Finland held on to 56% of ball possession, they only managed four strikes on the target from their twelve attempts. Mukarama Abdulai collected her second player of the match award as Ghana ended the game with five of their 23 attempts striking the target. The woodwork denied Ghana their fourth goal while a robust Finland back-line thwarted eight shots from the Ghanian strikers. A breath-taking run from Mavis Owusu down the right flank ended with a decisive cross from the byline. Finland’s skipper Tuuli Enkkilä messed up her clearance allowing Millot Pokuaa with a simple strike to put the Black Maidens up 1-0. Pokuaa turned the provider with a pinpoint cross from the right byline which sailed over three Finnish defenders to find an unmarked Mukarama Abdulai to head into the goal past the diving Anna Koivunen. 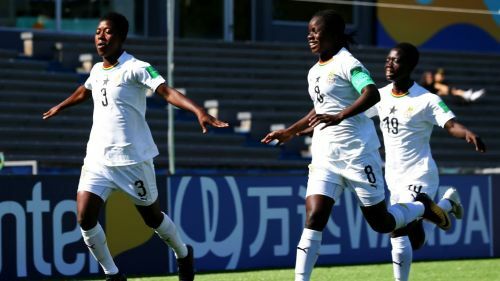 In the second half, a long-range effort crashed against the crossbar denying Ghana a third after Anna Koivunen got soundly beaten by the depth of the strike. Vilma Koivisto’s thunderous drive from 30 yards out bounced off Ghana’s goalkeeper Grace Boadu. Jenni Kantanen pounced on the free ball to slot it home scoring Finland‘s first goal at the U-17 Women’s World Cup. On the other end, Finland goalkeeper Anna Koivunen committed a fundamental error to go for the punch, lacking the strength to thrust it out from sailing into the goal, resulting in the third for Ghana from Animah Grace’s free kick. Finland could have scored their second of the match when Annika Huhta rounded the keeper in the final moments. But her effort got blocked by Justice Tweneboaa on the goal line as Argentinian referee Laura Fortunato sounded the whistle sending the Finnish contingent into tears. Finland became the first team to be eliminated from the World Cup and would hope for a consolation win over the hosts Uruguay in their final group game.